As organizations grow, so does their data. Sounds good right? Well, here’s the issue. As data grows, the hunger for that data increases. How do you ensure users can find what they need? 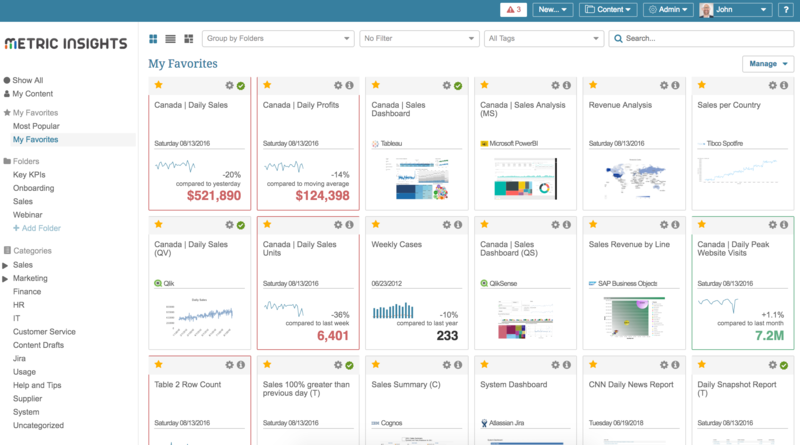 Typically by investing in many different Business Intelligence tools to create dashboards, reports and visualizations. However, with too many tools, and too much information, comes too much confusion for end users on where to go to find the right content. Now your users have to hunt for the content they need, and when they can’t find it, they stop using those tools altogether. When users can’t find the data they need, they immediately line up and start putting requests into the BI team for the reports they need, even though those reports already exist. Are you inundated with requests for information? Do you have a handle on what reports are being created across the organization? Can your users trust the data that is out there? With Metric Insights you can deliver a single interactive portal that connects to all your data sources and provides a single source of truth for publishing, promoting and accessing all BI content. The portal allows BI teams to centrally control, certify and promote content for users across the organization. Users can easily search, favorite, and share content and discover related information that’s important to them. The portal is valuable when users are finding it difficult to locate a specific piece of content due to a large number of available reports and dashboards and/or a diverse set of BI tools. Portals are most useful if they are curated so that only trusted content is available. Start small by populating the portal only with the most heavily utilized content and expand content based on user demand. Adding too much content can cause information overload and can be distracting. If it is necessary to allow a large number of users to post content, differentiate certified content from non-certified content so that portal users know what data can be trusted. Organization of content is important – Think carefully about how to structure folders and categories so that the portal organization mirrors how users think about their role. Implement a mechanism for users to request access to key content as well as a process for users to request additional content to be added to the portal. In conclusion, stop hunting for content and start using it instead.